On a recent Saturday morning as I was about to take a sip of coffee, my 13-year old daughter poked her phone in between my cup and face. “Dad, do you think hairstyle would look good on me?” she asked. “Just a kinda a fashion person I follow on Instagram,” she said. I’m aware that my daughter follows a number of these “influencers” who offer fashion and makeup tips. I didn’t think much of it. Then today, I caught something in the news. It was “Leia Longstocking”. CNN had a video and article on this social media influencer whose actual name is Lil Miquela. The article startled me by revealing that Lil Miquela isn’t a living person. She’s a computer-generated image (CGI). My daughter wants to copy the hairstyle of a robot. 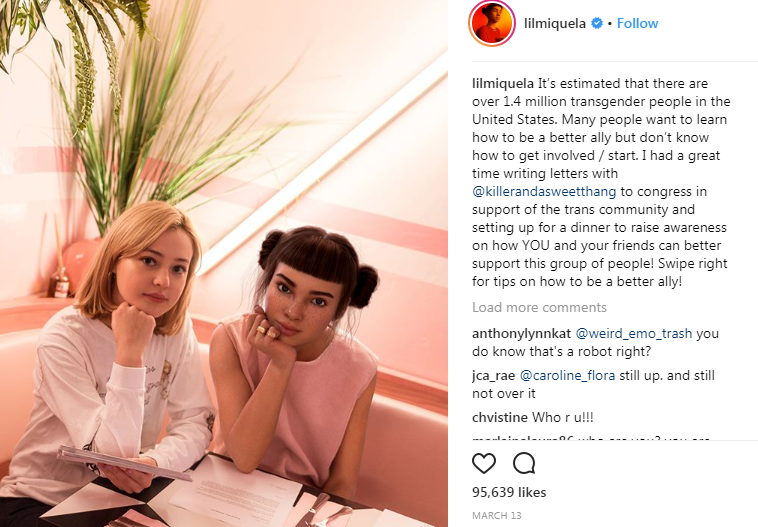 Lil Miquela has over 1.2 million followers, most of whom are young Millennials and Gen Zers. She goes places. She eats. She hangs out with friends. She’s writing letters to Congress in support of this cause. The person to her left is (I believe) real. I’m not sure who signed for Lil Miquela. I don’t know how influential her letters could be. I don’t know how influential her life should be. Do I want my daughter imitating her style? Liking her opinions? Do I want my daughter to emulate a fake person? Think about it. Her hands can’t be literally shaking. Her fans make her life amazing…except she’s not alive. But her Instagram life seems so real, so human. It is, apparently, real enough to fulfill Miquela’s purpose for being. 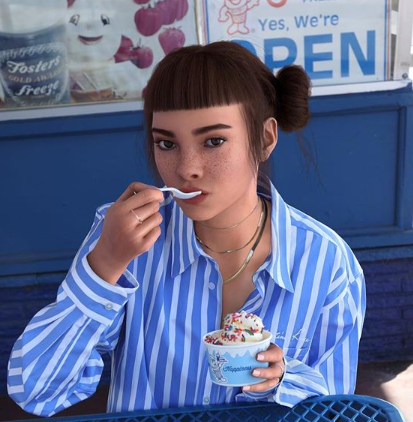 With her platform, Miquela qualifies as a social media influencer, which is a person who has a big enough following that it can be used for brand advertising. In other words, if Lil Miquela wears a certain brand of shirt and my daughter decides she must have that shirt, Miquela’s Instagram post functioned as an advertisement. The CNN report goes into how brands are responding to CGI as social media influencers. Suddenly the plan starts to reveal itself. They’re creating an ideal social media influencer for a certain target audience. It’s an ad imitating life so it’s a more effective ad…if you’re feeling a little confused, you’re not alone. Some people see credibility issues rising. 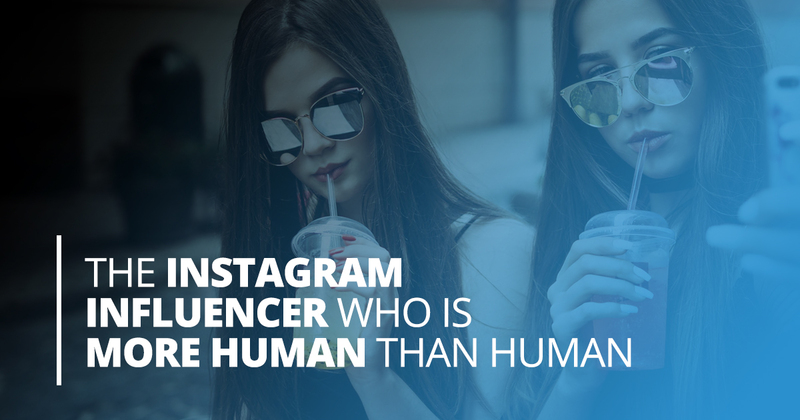 The idea of the social influencer is that they recommend products…but how can they recommend what they haven’t tried? On the other hand, advocates of this type of media personality note how judging any Instagram posts as “real” is problematic. After all, people alter images, contrive situations, and – given they’re functioning as paid advertisers – exaggerate their enthusiasm for products they represent. However, it’s clear that CGI social influencers are much more about selling an “idea” than a mannequin ever could be. This goes beyond a typical advertisement. We all know the Dos Equis “Most Interesting Man in the World” is just a character. The idea that his life could be real is ludicrous. However, with Lil Miquela they’re trying to win trust and build authenticity by feigning a real life. Indeed, her life on Instagram is completely plausible, but that doesn’t change the fact that they want people to trust a person who is only ostensibly real. They’re creating a human life that’s more human than any real life can be. Miquela is a perfect blend of fashion taste, opinion, and lifestyle to connect with her audience. She even blurs the lines of racial identity. It’s an audacious advertising ploy. At this time, the novelty of Miquela or CGI supermodel Shudu (whose digital artistry is stunning) is enough to draw attention because of the medium itself. But you have to wonder, will people start interacting with these personifications in the way they would a real person? Since it’s all happening through digital, does it matter that one person is actually digital? Commerce is our goal here at Tyrell. More human than human is our motto. These digital personifications are still so new people are trying to get their head around them (comments on Miquela’s posts show how disoriented many people still are with this). As I looked again at Miquela’s Instagram, I realized that her CGI origins were visible. I was surprised I didn’t notice it when my daughter first showed me the picture, but at that moment it didn’t occur to me this was anything other than a real person. I went back to my daughter today and asked if she knew Lil Miquela was CGI. She shrugged and stared at me with an expression so blank it gave me pause. “I don’t know. I guess I thought it might kind of freak you out”. Then she broke out in giggles. “That’s my CGI face, Dad!” Good one, kid. Like many, I do find CGI personifications on social media a bit freaky. As a high-tech mannequin used to model clothing and hairstyles, I can see it. But as something meant to emulate a human personality and lifestyle? I’m not ready for that paradigm yet. But maybe Miquela’s fans are. Perhaps it’s through them that she indeed lives. And brands know something else. It’s definitely through the fans that she’ll make money.